Ross Byers’ hobby became a business soon after he had gifted his friends with duck and goose calls that he had handcrafted. In 2004, when Bass Pro Shops opened in Toronto, he received for Christmas a number of gift cards for the store. Byers bought a bunch of merchandise, including a hunting DVD, which referenced a “high end” duck call. He decided to treat himself and ordered the more expensive duck call instead of his usual off-the-shelf $10 one. “I looked at it and figured it wasn’t too hard to make. And I couldn’t have been more wrong,” he laughed. He then went online and found a kit that included all the material he needed to make his own call, but he didn’t like the sound. “So trial and error and making my own jigs, I came up with something that I really liked and other people like as well,” Byers said. 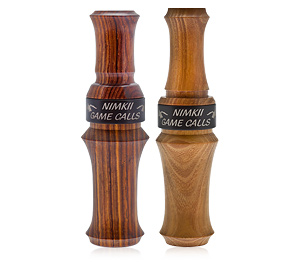 And that was the start of Nimkii Game Calls, maker of Hand Crafted Duck and Goose Calls; Ojibway made, Peterborough made, Canada made. “They’re all handmade, one at a time. It’s more of an art form,” said Byers. He uses different types of wood, some exotic, like hedge and African blackwood, and some local, like ash and maple. Byers said he is starting to use more local wood as it is easier to access. The different woods, which range in degrees from soft to hard, result in different products. Softer wood produces a mellow sound, while hard wood accentuates the call, making it louder. 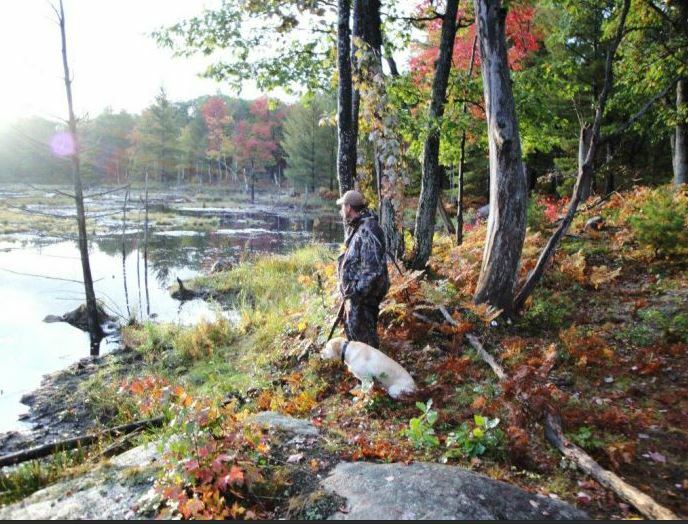 Hunting over large bodies of water require a call that is louder, while beaver ponds and timber areas need a softer sound, he said. Byers also works with the shapes and lengths of his calls, something he discovered through trial and error and through discussion with other hunters. 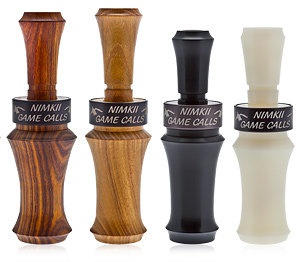 “There’s all different factors that affect how a call works, whether it’s a duck call or a goose call,” he said. There is also a technique to using a call, which will produce different tones, different strengths in sound and different lengths in the call. “You have to use your stomach actually; bring it up with guttural sounds,” he said. Byers can produce two calls in an eight- or nine-hour day. He works out of his garage in Peterborough, just south of Curve Lake First Nation. Byers’ grandmothers are Ojibwe from Curve Lake and his grandfathers are Irish. He spent summer days in the Kawartha Lakes area of southern Ontario and the fall in the marshes and woods. Family members shaped Byers into a deer and moose hunter, he says on the company’s web page, as well as an avid waterfowl hunter. Byers crafts the calls after he comes home from his full time job as a slot shift manager at a casino outside of Toronto. Orders come in through word of mouth and social media – Facebook, Instagram, Twitter, and now Pinterest. Byers is particularly busy making calls in August through October, when the waterfowl hunt is going on. He provides calls to local hunters, and ships his product across Canada, as well as to a number of locations in the United States, including Texas, Alabama, and Louisiana. His calls are also stocked in a couple of stores, and Byers has numerous repeat customers. “They like how easy it is to use. They like the quality of the finish on them, the different materials,” he said. At one point Byers was doing mail orders, but he couldn’t keep up with the demand. So after two seasons, he closed off that avenue. He would like to grow his hobby, and there are a “couple of guys” who would be interested in helping him out, but at this point, Nimkii Game Calls remains a “one-man show” because he doesn’t make enough to pay employees. In his best year, Byers said he made over 100 calls. “I really enjoy doing this, taking a piece of wood and seeing what you can come up with at the end of the day,” he said. Got to nimkiigamecalls.com for more information.